Little guys like cars, trucks & trains. Little guys (and big guys) in New York City tend to be a little infatuated with the subway. Living across the street from the Transit Museum doesn’t help… Because of this, every year when my wife and I ask our oldest son (now age 4): “What do you want to be this year for Halloween?”, what he hears is “What subway train so you want to be this year for Halloween?”. Last year he wanted to be the three train – this year, after much discussion, he has decided to be the seven. Full photoset posted on Flickr . Added lights on the inside, my son sometimes asks me why I didn’t make the doors open and close automatically. Time lapse of the inside foam-core structure being assembled. Very well made costume. All he needs now is a matching conductor’s uniform and he’s all set to go. omg is there any chance you willing to sell/rent this for halloween 2012? Did you spray paint it? What type of paint did you use? Hi Matthew, my son loves subway trains too! My friend and I want to make him the subway costume for this Halloween. Did you make blue prints for the costume that we could pick up? Do you have any additional advice before we start trying to assemble it? I don’t know if you rented it last year, but we would love to buy or rent it this year. I did not have the space (or time) to properly spray paint. I ended up using acrylic pant and a brush. For the 2nd smaller one, I used the black Foamcore for construction, it made the painting process much easier. Hi Matthew. Thanks for this! I will be making one this weekend. Quick question…for the one that you made with the Black Foamcore, how much does it weigh? My son just turned 3 and I was hoping that it will not be too heavy for him this Halloween. Was going to head down to B&H Photo to get the Foamcore if it not too heavy. Thanks in Advance, John. Thanks for responding. I hope you don’t mind one more question about construction? Are the shoulder straps secured to the inside of the costume? perhaps to one of those cross supports? or are they resting right underneath the top layer of rounded foamcore that creates the top of the train? Any information would be helpful. Thank you. Hi Matthew, we are Brooklyn based. Any chance we could rent or buy the costume for you for this year’s Halloween? I wish I could be as crafty as you, but I don’t think that is at all possible. Kindly let me know. Love the costume!! Could you post the time lapse video again, please?? Thank you!! Hi Matthew, I don’t have a website. But if you please email me your response I would appreciate it very much. Or I could also read your message here on your New York City Subway Train Custome blog. I have all the pieces ready to put together, I only need to get the glue. Any other information would be very much appreciated. 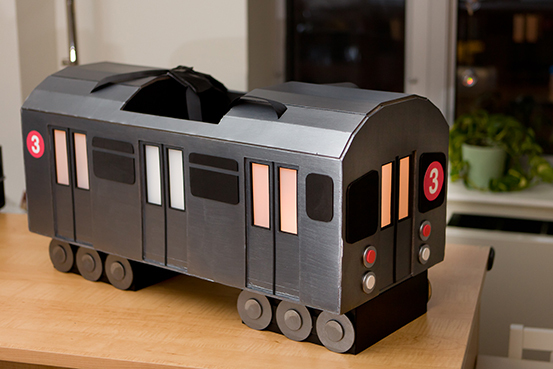 Hi Matthew – I am trying to make a NY Train custome for my grandson. 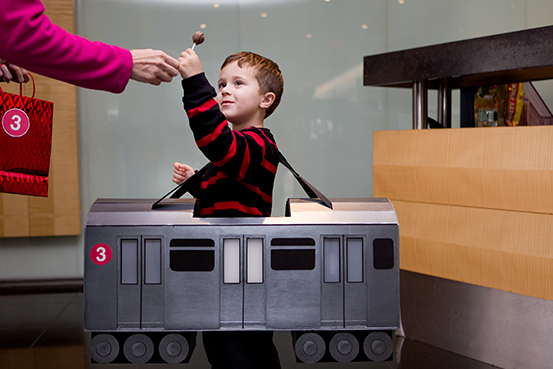 He’s 4-years old and loves trains, especially the Subway Trains. I would like to ask you a question please. How are the shoulder straps secure to the inside of the custome? I would appreciate very much your help. Thank you in advance and Congratulations for your wonderful NYC Subway Train Custome.